Locker Financial Services offers its clients an opportunity to engage us to provide you with active portfolio management and on-going financial advisory services. 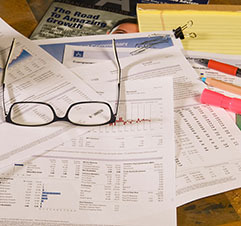 These services include opening new accounts, supervising the transfer of assets, daily monitoring of accounts under our management, the production of asset reports every quarter that allow you to clearly see your investment returns, portfolio re-balancing as appropriate, and the tracking of Required Minimum Distributions. We are also available to you by phone, email or in person to discuss any financial concern or life event that might affect your current investment position or to answer any general questions about money matters. As an asset management client, we expect to have a long-lasting and dynamic relationship with you and your family. We anticipate that we will share many key life events with you, including helping you prepare for things like births, graduations, marriages, retirement and end-of-life. To do all of this successfully, we need to first discuss and prepare a holistic financial plan for you. Included in this plan is an assessment of your investment style, risk tolerance and appropriate level of diversification. This forms the basis of a strategic asset allocation plan that guides us in our management of your accounts. Our primary investment choice is no-load mutual funds. However, your investments may include: equities (stocks), corporate debt securities, commercial paper, certificates of deposit, municipal securities, and U. S. government securities. Locker Financial Services custodies all accounts with Charles Schwab & Co., Inc.
Fees for asset management and investment advisory services are taken as a percentage of the total assets under management. Fees are paid on a quarterly basis in arrears.